The most famous moment in Wrigley Field history occurred. Or did it? It was Game 3 of the World Series. The Yankees had won the first two at Yankee Stadium. Soon-to-be President Franklin Delano Roosevelt (sitting next to Chicago mayor Anton Cermak) threw out the first pitch. In the stands; a young boy named John Paul Stevens, who would go on to become a Supreme Court Justice. The 1932 Yankees were a riled up team who hated the Cubs for dissing one of their former teammates. 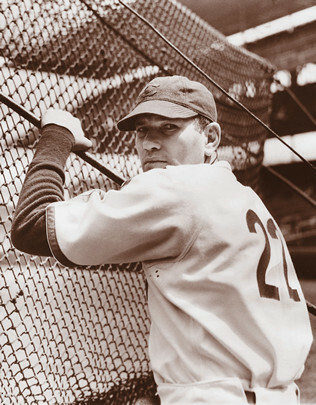 Mark Koenig had replaced Cubs shortstop Billy Jurges during the season after Jurges was shot by a fan. Despite hitting .353 during the season and saving the hides of the Cubs, the players voted not to give him a full World Series share. This really angered the Yankees, especially their emotional leader Babe Ruth. He was ticked off and let the Cubs know it in no uncertain terms. Did Babe Ruth really call the shot? Almost certainly not. The writers said he did, and he played along with it, but he also privately acknowledged that he never would have done that to Charlie Root who was known as a ruthless headhunter. Charlie swore to his dying day that Babe did not call the shot. According to the Cubs players, Ruth was being taunted by the Cubs dugout (who should have had their heads examined after they already ticked off the Babe). Ruth was more than likely pointing at the dugout, gesturing that he still had one strike left. That may have looked to the writers like he was calling his shot. 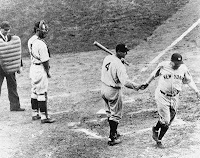 Plus, the writers said he pointing to left–but he hit nearly all of his homers to right, and the actual homer went to deep centerfield…an unusual location for a homer by the Babe. The called shot is probably nothing more than a legend. Nevertheless, part of the legend is true. He did homer. And Gehrig homered right after that. And they both homered again later in the game. The 1932 World Series was a 4-game pummeling. But as famous as that supposed “called shot” was, Babe Ruth was not even the player of the series. Lou Gehrig hit .529, and would have been named the MVP if they had such an honor in those days. Andy Pafko puts the finishing touches on a great season. Joe DiMaggio is probably known as the greatest player in baseball history to possess both power and patience at the plate. In four different seasons he actually had more homers than strikeouts. His final career numbers are absolutely jaw dropping: 361 homers, and only 369 Ks. One Cubs player also had that same combination of power and patience, and his 1950 season in particular can only be described as “DiMaggio-esque”. That year Andy Pafko knocked the ball out of National League ballparks 36 times while only striking out 32 times. Only 14 players have ever accomplished that feat: Ken Williams (1922), Lefty O’Doul (1929), Mel Ott (1929), Al Simmons (1930), Lou Gehrig (1934, 1936), Joe DiMaggio (1937, 1938, 1939, 1940), Ted Williams (1941), Willard Marshall (1947), Johnny Mize (1947, 1948), Stan Musial (1948), Yogi Berra (1952, 1956), Ted Kluszewki (1953, 1954, 1955, 1956), and Barry Bonds (2004). Pafko’s 1950 season was so impressive that Reds’ president Warren Giles said if he could choose any player in the National League to help improve his team, he would choose Pafko. Naturally, Handy Andy was rewarded for that incredible season in true Cubs fashion. He was traded to the Brooklyn Dodgers. October 1: In 2008 Ryan Dempster walks the bases loaded then gives up a grand slam to James Loney as the Dodgers beat the Cubs in Game 1 of the playoffs. The Cubs played their first playoff game in 39 years. The 1984 Cubs won the division going away with the most wins in the National League (96). 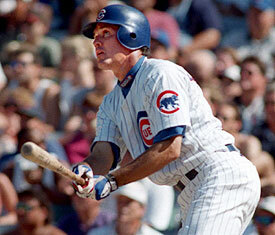 They had the most exciting young player in the league (MVP Ryne Sandberg). They had a team of veterans (Cey, Moreland, Bowa, Sutcliffe) that had won championships before. With that entertaining cast of cast of characters, and Harry Caray at the microphone broadcasting every single game on a Superstation (WGN), the 1984 Cubs were America’s darlings. The first game went exactly as planned. Cy Young winner Rick Sutcliffe shut down the Padres on the mound, and Cubs batters immediately took it to San Diego. In the bottom of the first inning lead off man Bob Dernier cracked a homer, and two batters later Gary Mathews did the same. He later hit another one, as did Ron Cey, and even the pitcher Rick Sutcliffe joined in on the fireworks display. At the end of the game the scoreboard said: Cubs 13–Padres 0. America’s darlings were well on their way to the title. October 2: In 1932, the Yankees sweep the 1932 World Series with a crushing 13-6 victory. Future Cub Tony Lazzeri hits 2 homers for the Yanks. In 2001, Sammy hits his 60th homer in a 5-4 loss. In 2008, every single Cubs infielder commits an error and the Dodgers take a commanding 2-0 lead in the five game series. Ken Griffey’s final game of the 1976 season is a cautionary tale for anyone who tries to take the conservative way out to win the batting title. He was leading the league in hitting on the second to last day of the season, and when someone did the math, it looked like there was no way he could lose it. The second leading hitter, Bill Madlock of the Cubs, would have to go 3 for 3 or better to steal it away. Going with the odds, Griffey was rested on that last day to secure the title. Unfortunately for him, Bill Madlock decided not to follow the script. He got hits in his first three at-bats of the Cubs game, and word reached Griffey in the Cincinnati dugout that his batting title was at stake. So, he came into the game as a pinch hitter and made an out. Madlock, on the other hand, got another hit, ending his day 4 for 4. 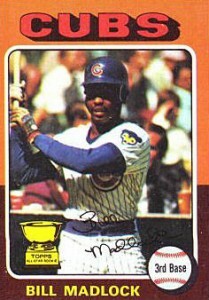 The batting title went to Bill Madlock, his second batting title during his Cubs career. The 1976 Reds went on to win the World Series that year, while the Cubs finished in the cellar. And, after the season ended, Cubs owner Philip K. Wrigley authorized the team to trade Madlock so that he wouldn’t have to meet his salary demands. (The Cubs traded him to the Giants for Bobby Murcer.) But Ken Griffey Sr. played another fifteen big league seasons and never won the batting title. 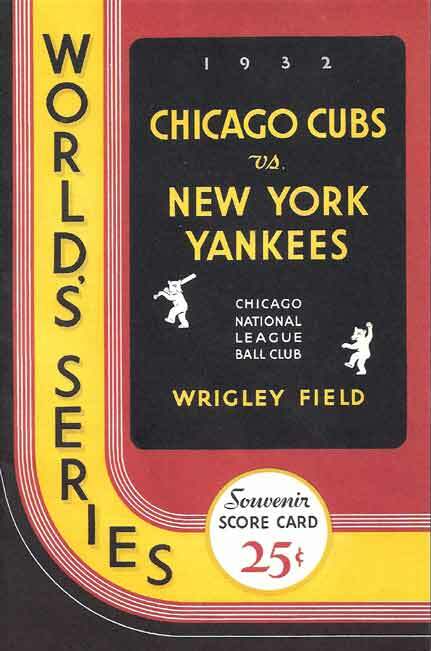 October 3: In 1930 the Cubs win a rare game in the City Series against the White Sox.7. In 1998, Kerry Wood faces Greg Maddux in the playoffs, and Maddux comes out on top to sweep the Cubs out of the playoffs. Wood will miss the entire 1999 season because of an injury. In 2000, Jon Lieber wins his 20th game of the season, 13-7 over the Reds. If you look at the roster of the 1989 Cubs, you realize that they had no business making the playoffs that year. Even manager Don Zimmer and general manager Jim Frey thought they would win about 70 games. Two thirds of the starting outfield were rookies–Jerome Walton and Dwight Smith. Rookie catchers Damon Berryhill, Joe Girardi, and Rick Wrona split time behind the plate. The third basemen were Vance Law and Luis Salazar. But somehow, with this group of players and the veteran presence of Ryne Sandberg, Andre Dawson, and Mark Grace (who was actually quite young too), the Cubs caught lightning in a bottle. This motley group became known as the Boys of Zimmer. Don Zimmer’s unorthodox managing style confounded his opponents all year, and with smoke and mirrors the Cubs won the division. Mark Grace led the team with a whopping 79 RBI. The rookies played way above their heads. Jerome Walton was the rookie of the year and had a 30-game hitting streak. Dwight Smith hit .323 in left field sharing time with converted catcher Lloyd McClendon. Shawon Dunston became a sensation with his frightening arm at shortstop, and the entire city followed his batting average thanks to the Shawon-O-Meter; maintained by a bleacher fan. A crazy kid reliever named Mitch Williams had the most terrifying saves imaginable–yet he pulled it off time and time again. And a young pitcher emerged to lead the starting rotation…his name was Greg Maddux. Still, this team had no business being in the playoffs and they discovered that pretty quickly. The Cubs were clearly overmatched by the Giants, who sported a lineup featuring the likes of Will Clark, Matt Williams, and the MVP of the league–Kevin Mitchell. They say that good pitching always beats good hitting, which can mean only one thing. The Cubs didn’t have good pitching. Greg Maddux was torched in Game 1. The Cubs lost 11-3. The worst moment of the game occurred when Don Zimmer came out to talk to Maddux just before Will Clark came up to bat. The first pitch after the mound visit was crushed for a home run. Clark later said he read Maddux’s lips and knew which pitch was coming. That moment sparked the trend of pitchers and catchers covering up their mouths with their gloves when they talk. October 4: In 1935, the Cubs lose Game 3 of the World Series to the Tigers, 6-5 in 11 innings. The Tigers have a 2-1 lead in the series. In 1992, Andre Dawson hits his last homer as a Cub, and the 399th of his career. The Cubs won their first playoff series since 1908. Kerry Wood was on the mound in Atlanta, facing off against Mike Hampton. Cubs leadoff man Kenny Lofton got the ball rolling immediately, scoring in the top of the first on a Moises Alou single. The Cubs added a second run in the top of the second on an Alex Gonzalez home run, and then padded the lead in the sixth on a two-run homer by Aramis Ramirez. 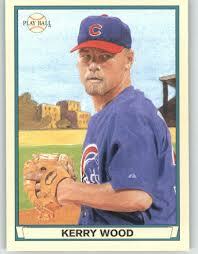 Kerry Wood did the rest. He struck out seven, allowed only one run, and was named the MVP of the series. (He had also won Game 1 in Atlanta). The Cubs didn’t win another playoff series until 2015. October 5: In 1935, the Cubs fall behind 3 games to 1 in the World Series after the Tigers beat them 2-1 at Wrigley. 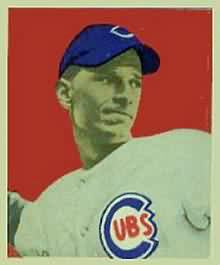 In 1938, Cubs ace Bill Lee loses Game 1 of the World Series to the Yankees, 3-1. In 1980, Bill Buckner wins the batting title. 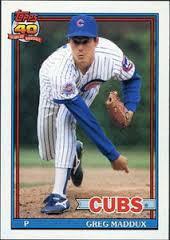 In 1989, the Cubs beat former Cub Rick Reuschel 9-5 to even up the NLCS at 1 game apiece. Mark Grace is on fire. The Cubs were playing in the World Series against the New York Yankees at Wrigley Field. The Cubs had dropped the first game of the series, but for Game 2 they had their old warrior Dizzy Dean (photo) on the mound. The Cubs actually had the lead going into the 8th inning. Somehow, the cocky Dean was getting them out with nothing more than guts and guile. It really looked like he may have one more miracle left in that bag of tricks. Then the Yankees came to bat in the top of the eighth. Leadoff man Frankie Crosetti knocked a ball out of the park, and the Yanks took a slim lead. The score was 4-3 in the ninth, and ol’ Diz took the mound one last time. Tommy Heinrich led off the inning with a single, and Joe DiMaggio came to the plate. DiMaggio was the most feared hitter in baseball that year, and it didn’t take Dizzy Dean too long to figure out why. He easily cleared the left field wall with a mammoth shot, and the Yanks sealed the win. Dizzy was yanked from the game, never to return to the big stage again. After losing those first two games in Chicago, the series was essentially over. The Yankees beat Clay Bryant 5-2 in Game 3, and then clobbered the Cubs in Game 4 for an easy four game sweep. October 6: In 1935, the Cubs win Game 5 of the World Series against the Tigers, 3-1. Cubs ace Lon Warneke gets the win. In 1945, the Tigers tie up the series by beating the Cubs 4-1. Dizzy Trout (father of Steve) wins the game. In 1963, the Bears beat the Colts 10-3 on their way to the NFL Championship. In 2007, the Diamondbacks sweep the Cubs out of the playoffs. October 7: In 1945, the Tigers go up 3 games to 2, by beating the Cubs 8-4. In 2001, Sammy Sosa hits his 64th homer of the season in a 4-3 loss to the Pirates. In 2016, Jon Lester outduels Johnny Cueto and Cubs beat the Giants 1-0 to take a 1-0 lead in the NLDS. Javy Baez hits a homer for the only run of the game.